We read about your Mom's neck on Katnip Lounge comments and we send purrs for healing to her today. We see a pink toenail! Very beautiful picture. Have a lovely Sunday. By the way, I started following you through Bloglovin. That is a beautiful photo...nice job! Awww what a beautiful picture Allie. SMOOCH! Pretty picture! Hope you are enjoying your view! That is one great picture of you and green grass! 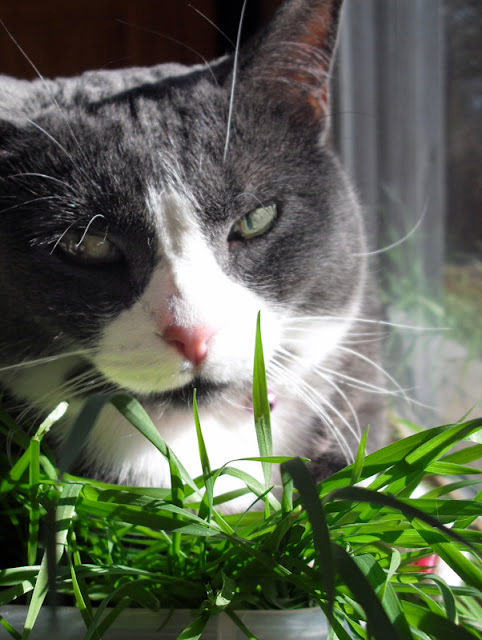 Sun and some cool green grass to chew on - nice! Having a bit of grass Allie? That grass is just asking to be chomped! Hi Allie, how's the grass today? Bet it's nommy. *sigh* Allie yoo are so pretty...combine dat wif da awesome barfisode yool soon have from eating dat grassy stuff...well..it a purrfect Sunday. Hi Allie, I see your little pinky nail peeping through the grass. Allie, I just love what you've done with your furs and pink nose. You are always so stylish.